A boy, Andy, recently came into my office with his father. The family is having difficulty getting Andy to leave the house. We began by cartooning a basic errand (grocery store visit) to create a visual to reference and to see if Andy could share what was causing him anxiety/discomfort. When Andy could not identify anything in particular, we moved to breaking the action down into small steps (This can be seen on the right hand side of the image). Once we were able to break the larger activity (daunting in its entirety) down into smaller steps, we then role-played through the grocery store visit. I did this with Andy, including him in things like helping me “ckeck out”, choose produce, etc. Then we went through each step and rated the step on a scale of 1-10 (1 = not scary at all, 10 = overwhelmingly scary). By the end of this exercise, Andy was smiling and stated that the errand of going to the grocery store did not sound scary to him anymore. 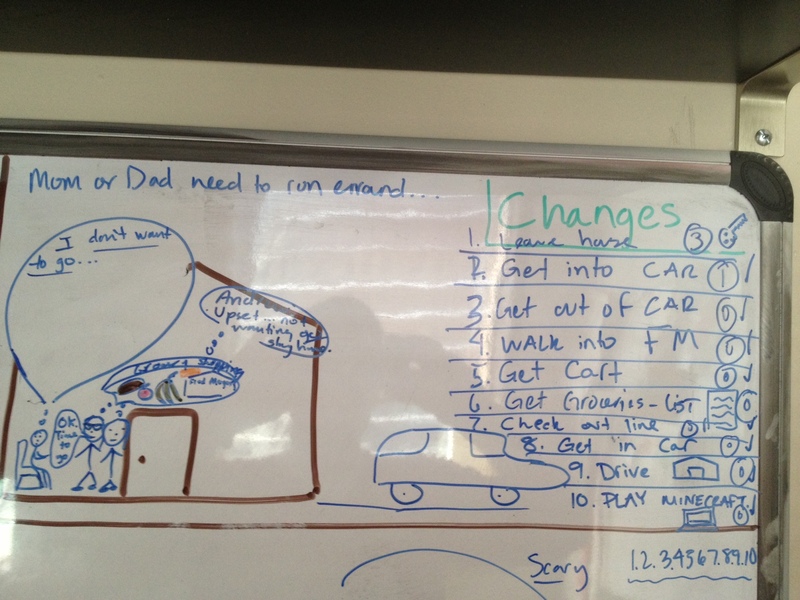 Another parent I work with recently made a step-by-step incentive chart for her son’s daily chores. The chore of cleaning his bedroom was broken down into simple, manageable steps. The visual chart had a picture of his clean room on the front and the steps for cleaning on the back. A money incentive ($.50 for completing the 4 steps) ran across the bottom of the chart. The boy has a piggy bank where he keeps his earnings. Both these examples take a large task and break it down into manageable steps. I love to role play these events after breaking them down, because it adds another level of practice to a new or challenging sequence of events. By creating a rating scale (1-10) for each step, we can target the scariest part of the overall task and spend more time processing and preparing for that piece. I also love the analogy of baking bread (a very deliberate process) – something I have taken on as a hobby within the last year.